True Timber, Camo, Set. You design. Several Colors Available. For this crib set, we have "True Timber" minky fabric, olive & red minky dot fabric. Embroidery is not included but can be added for an additional fee. You can also swap out the red for any other solid color. 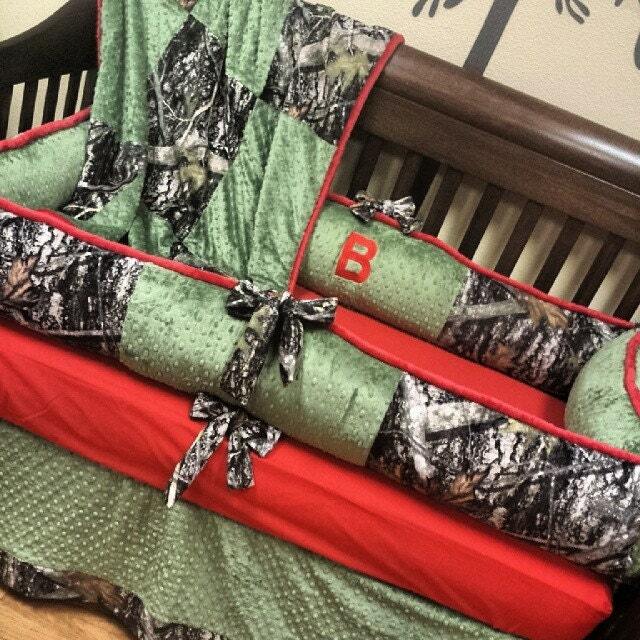 I'm the daughter of Toni who purchased this beautiful brown and green camo crib set. I wanted to write and say how thankful i am for such an incredibly beautiful gift. You are truly a talented women and I will carry this set with my son from here on out. This set will grow with him throughtout his childhood and I want you to know your work will be dearly cherished. Thank you so much for making this a special and memorable christmas. Merry Christmas to you also!! !